Placement of the MattThe front edge of the mat must be a MINIMUM distance of 2m from the rear ditch (edge of the playing surface). Indoors 2m just covers the 'T'. This MINIMUM DISTANCE applies both for Indoor and Outdoor, and EBF (English Bowling Federation) and EBA (English Bowling Association). A 2m stick measure is available to check, and the green is marked on the side banks with a 2m and a 4m indicator. EBF : 2m is the legal distance for the mat on the first end, thereafter it may be moved anywhere up to a MAXIMUM of of 4m from the rear ditch. EBA : the mat may be placed anywhere at any time (including the first end) but never less than 2m and as far as the 25m marker on the side bank from the opposite end, with due thought to the Jack Length. the FRONT of the Mat to the NEAREST part of the Jack. (For reference and as a guide : if the Mat is brought up and aligned with the first 25m marker, the Jack must reach the 'T'). When taking possession of the rink, stand with feet together centrally on the mat facing down the rink towards the far rink number. DON'T squeeze your feet tightly together - be comfortable, relax! This is your Basic Position. To cast the Jack, move to the side of the mat so that only one foot (the Anchor Foot) remains allowing the delivery arm to now be centred on the mat. To deliver the bowl, first go back to your Basic Position; depending on the side of the rink to be played, shift both feet diagonally across the mat. 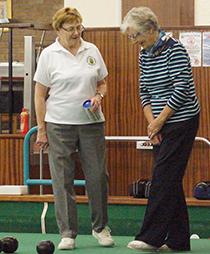 New bowlers are encouraged to stand diagonally corner to corner, at an angle which can later be adjusted according to the bowling line required. The need to bowl around or inside a short bowl, or to a displaced Jack is where the lateral use of the mat can help: the Anchor Foot on the side of the mat can produce a different line! ............. which is why it is so important to consistently stand in the correct position on the Mat! For delivery on the ditch side ensure the Anchor Foot (or part thereof) is placed on the side of the mat furthest away from the ditch. Should a game become 'a bit one-sided' it is good play to consider changing either or both the length of the Mat and/or Jack. A good Skip/Lead rapport will judge the moment. The Mat can be taken up the rink as far as the 25m mark, i.e. allowing for a 23m Jack (on the 'T') plus the 2m to the edge of the ditch. Coach's Caution: Many a game has been changed by taking this initiative BUT PRACTICE HELPS ! ! ! Check your position on the mat - never stand square (except for casting of the Jack, or preparing to drive after giving a warningto the bowlers at the head). Turn feet and body to face the 'shoulder' - the widest point of the bowling line before the bowl starts to lose pace and the bias takes effect. Visualise and Step out onto this line smoothly propelling your bowl to that point. Swing slower; this will help, but it may be necessary to check the length of your forward step as well as the amount of backswing. Bend the knees, to enable the bowl to be released as close to the ground as possible. Releasing too high, or reaching too far forward will result in 'dumping'. The bowl should be released just in front of the leading foot. 1. Use the Mat! Place your anchor foot on the side of the mat away from the ditch: as long as part of the anchor foot is in contact with, or over and within the confines of the mat as the bowl is released, there should be no danger of a foot-fault. This allows an extra mat-width of land/green. 2. Should the jack be moved closer to the ditch making it less accessible, consider playing to the shot bowl. It isn't alway necessary to draw to the jack. 7.1. Before delivery a player must be standing on the mat with all or part of at least one foot on the mat. At the moment they deliver the jack or bowl, the player must must have all or part of one foot on or above the mat. 13.1 Possession of the rink will belong to the player or team whose bowl is being played. 13.2 As soon as each bowl comes to rest, possession of the rink will transfer to the opposition player or team after allowing time for marking a toucher as soon as it comes to rest. ETIQUETTE: a player may only request or receive information whilst in possession of the rink. More tips will be added .... keep an eye on this page.